The health benefits of borage oil are due in part to it being one of nature's richest sources of gamma-linoleic acid (GLA), an essential fatty acid that is showing promise in areas of research for the treatment of diseases, notably with rheumatoid arthritis and diabetic neuropathy. The therapeutic properties of borage oil are believed to derive from a significant percentage of gamma-linoleic acid (GLA) found in the plant's seeds and leaves. Part of the family of essential fatty acids (EFAs), GLA is an omega-6 fatty acid that the human body converts into prostaglandin E1 (PGE1), a class of fatty acids beneficial in the reduction of inflammation. Both omega-3 and omega-6 are not produced within the body, thus they are only acquired through consumption of food or supplements. The human body synthesizes linoleic acid (LA) from omega-6 into gamma-linoleic acid. While it was thought most individuals converted LA to GLA with ease, newer studies have found a large percentage of the population unable to convert GLA due to nutritional deficiencies, such as in cases of alcohol abuse and a host of other medical conditions that may disrupt nutritional absorption. Therefore, for many individuals the primary source of acquiring GLA to ensure proper nutrition is through a supplement such as borage oil. Children with low levels of GLA can also benefit from taking borage oil supplements. Historically, borage oil was used to treat a variety of ailments, including stress and fevers. In times past, the flowering plant was considered a mood lifter. Borage tea was taken to alleviate colds and fevers. In the culinary world, the leaves, similar to the taste of cucumber, are tossed into salads. The star-shaped blue flowers are also used in salads and refreshments. Modern research into the nature of omega fatty acids, like omega-6 and omega-3 demonstrate the important role of these fatty acids in maintaining brain function, as well as providing the building blocks of early development. The regulation of metabolism, immunity and maintenance of bones are just some of the health benefits of borage oil as a healthy source of omega-6. 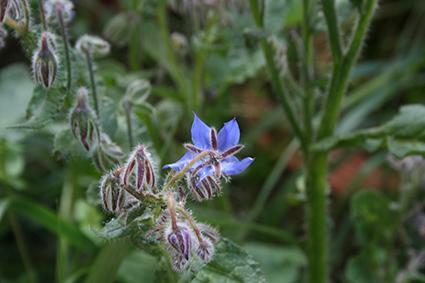 Modern medicine also began taking an interest in the blue-flowered plant, to find if there were other medicinal properties of borage, which could play a role in the treatment of disease. The areas of research most promising exist in the treatment of rheumatoid arthritis and diabetic neuropathy. Other areas of research remain inconclusive, notably with conditions such as premenstrual syndrome, cyclic mastalgia and eczema. While borage oil is marketed as a treatment for eczema, clinical studies do not support conclusively any such theraupetic claims. Other proposed uses for borage oil continue to be explored, although research into its effectiveness in treating disease is still in its early stages. Some uses, such as in the treatment of cancer are in the infant stages of research; while other uses, such as the effectiveness of borage oil for premenstrual syndrome (PMS), have produced mixed results. Borage oil may cause mild side effects in some individuals, notably headaches, nausea and digestive distress. To reduce the likelihood of minor side effects, combine supplements with meals. If you are taking anticoagulants, are epileptic or have a known liver disease, consult with a doctor before taking borage oil. Women who are pregnant or breastfeeding should avoid taking borage oil supplements.